Plastering is quite a tricky job and I wouldn't advise a beginner to try anything other than patching in small areas. If you need to do a whole room get the professionals in. There are several different types of plaster for different jobs. There are several different types of plaster and you'll need to choose a one suitable for what you are doing. If you are plastering onto plasterboard or patching up a wall where the thin final layer has come away you'll need a thin skim with finishing plaster which can be put on up to about 2mm thick . 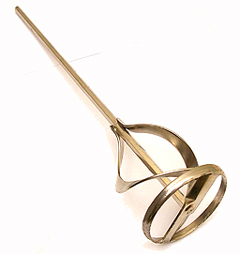 It's very fine and will give a smooth surface. 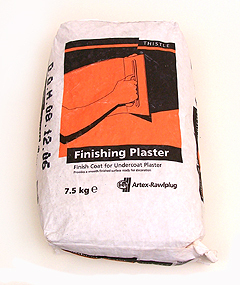 I tend to use a multi finish plaster which is suitable to go on plasterboard or undercoat plaster. If you need something thicker to patch in (like if you are patching up interior brickwork prior to a final finish) you will need an under coat of Bonding plaster or browning plaster. These are much more coarse than finishing plaster and you use these to the build up to your required level before applying finishing plaster. Check with your local supplier which type is best to use for your job which will depend on what surface you are plastering onto and whether you seal it first. To use you mix these types of plaster with water. They are quite easy to apply with a plasters float and because they are an undercoat you don't need to worry too much about the finish. Just aim for a fairly even finish a few mm below the final surface level. Picture right is a general purpose under coat plaster which should be fine for most jobs. 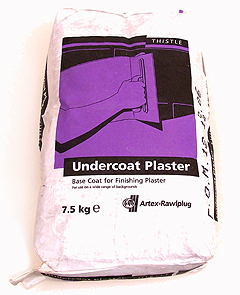 Alternatively checkout the thistle plaster site for what to use as well as loads of other useful info. This is a two part process whereby you first apply the plaster, then when its starting to dry after 20 minutes or so finish it of to get a nice smooth surface. Mixing. You simply mix the finishing plaster with water, (follow the instructions on the pack) BUT it is so important to get a nice smooth mix. For small jobs mix it in a plastic bucket. I used to try mixing by hand but it was never very successful. Now I always use a mixer bit for my power drill (on low speed). They are quite cheap and give a very smooth even texture. NB don't use high speed with the drill or you'll get plaster spattering everywhere!! You're aiming for a thick smooth creamy consistency. Use a plasterers hawk(flat plate with a handle on it) to load up some of the mix. With a plasters float spread it on to the wall. Use an upward motion curved motion the arc of your arm. Aim for a 2mm thick layer. Don't put too thick a layer on. Better to under do it than overdo it as you can always put more on when your first attempt is dry.Try and get a smooth level surface but don't overwork it as you'll be coming back to smooth it when it's almost dry. It will start to "go off" (become semi dry and workable)after 20 minutes or so(you should see the wetness go from the surface) and then you can smooth out any lumps or ridges. 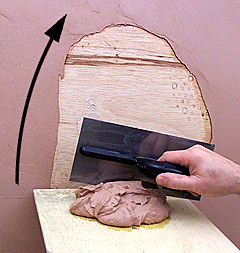 Spray a little water as you go and work the plaster with your float until you get a nice smooth finish. It's a bit of an art but if you persevere you can achieve good results.